Much of the Iranian Plateau is defined by mountains, which have historically separated Persia from the deserts which surround it to the west, north and east. 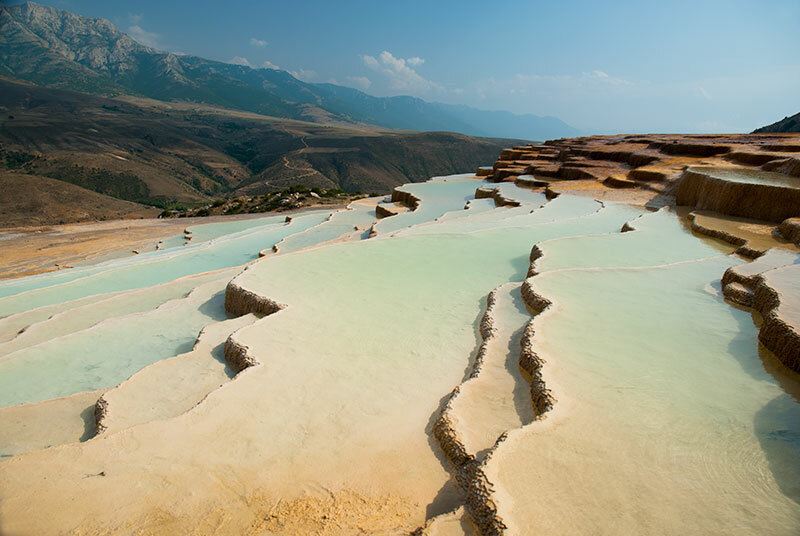 Arriving in Iran in the height of summer, when much of the country is uncomfortably hot, and having seen nearly all of the country’s main historical sites on three previous, lengthy visits, I planned to spend much of my time in Iran’s two major mountain ranges: the Alborz and Zagros. 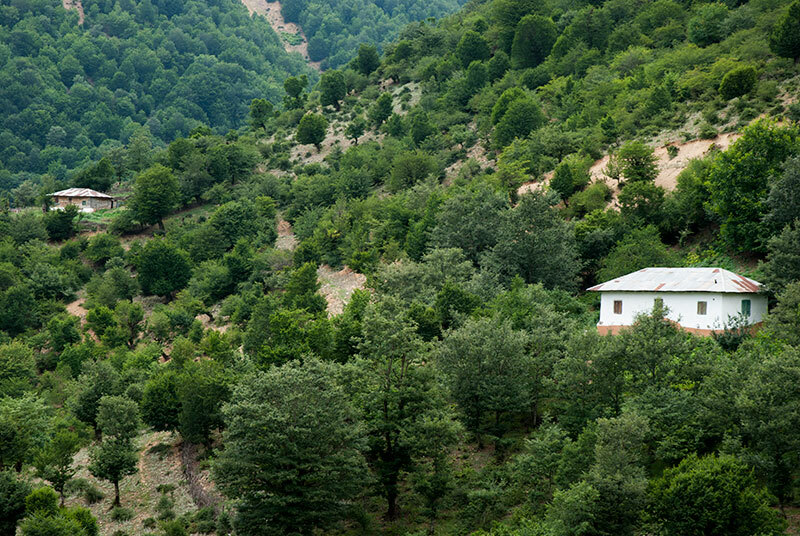 In the far north of Iran, running along the south coast of the Caspian Sea are the thickly forested ridges of the Alborz, which create a sharp physical divide between the humid coast and the near desert of the interior, crowned by Mt Damavand, the country’s highest peak and the highest volcano in Eurasia. 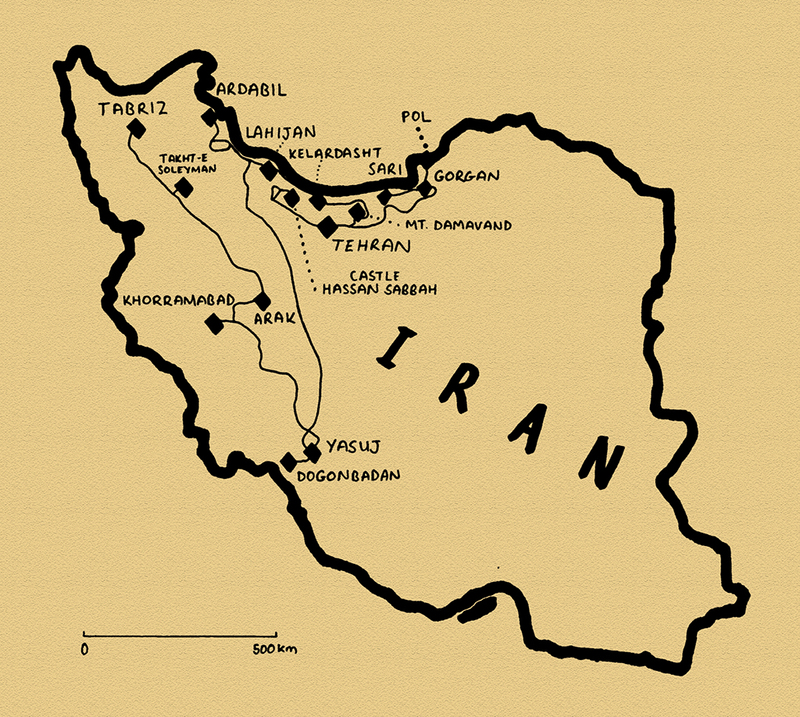 The Zagros are quite different; far less sharply defined, lower, and occupying much of the west of the country, but historically very significant; home to the forebears of modern Iranians and still inhabited by Luri nomads whose lifestyle cannot be far removed from the very first Iranians who had migrated from Central Asia around three thousand years ago. Driving roughly along the axes of these two mountain ranges, my journey would take me across much of northern and western Iran, ending in the caravan city of Tabriz. It’s the 28th June 2014 and after a comfortable overnight stay at the border, I am quickly passed through customs in the morning by the friendly customs officers. Driving away from the border, the landscape is initially similar to the barren, hard-baked mud of western Turkmenistan, but soon the signs of irrigation appear, then beyond the Turkmen town of Aq Qala, the Alborz Mountains; rolling green in their upper reaches and a patchwork of fields and settlements on their lower slopes. This is the fertile Gorgan Plain, an almost Mediterranean looking landscape of olive trees, golden fields of wheat and even the odd rice paddy. Pickups are parked at the roadside selling a wide range of fruit and vegetables. Men stand selling fresh fish, dangling them on lines hung from the ends of long sticks. Farmers in straw hats work the paddies and rest on their tools, watching the heavy traffic pass. Shepherds graze sheep on the grassy roadside, squatting in the shade of the old plane trees which grow aside this ancient artery of the Silk Road. All this comes from the presence of the mountains, which channel rainwater down onto the coastal plain. The difference between this and the dry, barren wastes of western Turkmenistan and Kazakhstan show acutely the contrast between the nomadic and settled worlds. I reach Sari early in the afternoon and set about looking for my old friend Kiavash. I go to what used to be his clothing boutique, which is closed, but one of the staff from a nearby fast food restaurant knows him and takes me a few blocks to the location of Kiavash’s new business, a coffee shop. I call Kiavash from the coffee shop and soon we’re happily re-united after more than four years. I stay with Kiavash for five days, reliving somewhat the slightly debauched weeks I spent with him in 2010; smoking, partying and meeting his friends. I meet Khazar, who helps me recover photos deleted by the Turkmenistani security services from my memory card, and other friends Shahin, Bahar and Shiva with whom we drive up into the lush foothills of the Alborz, walking into beautiful, thick, atmospheric primeval beech forest whose trees are in vivid lime green leaf, the ground thickly covered in crisp, brown, fallen leaves. Sadly I don’t have the same open-ended itinerary that I did in 2010, and must pull myself away from old and new friends, and start my journey across the country. I double back to the city of Gorgan, a city of great antiquity, once capital of the region known to the ancient Greeks as Hyrcania, famed even then for its fruit. 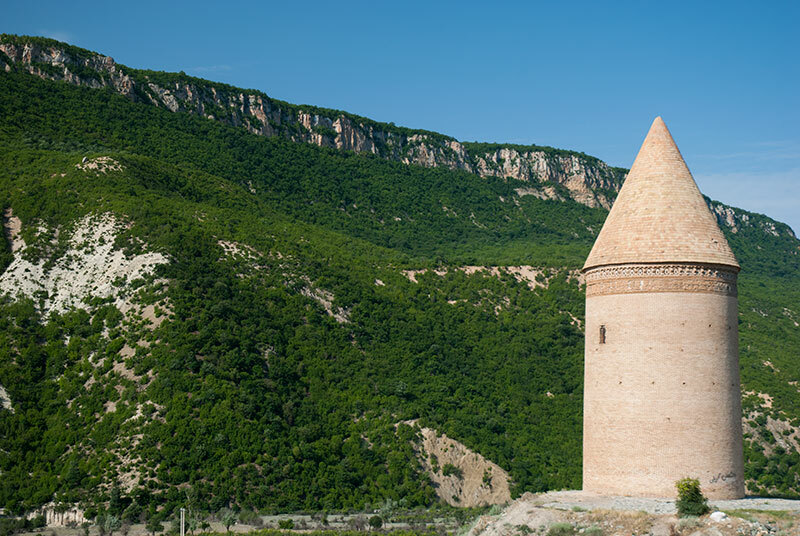 Surviving through Achaemenid, Parthian, Sassanian and Arab eras, Gorgan was razed by the Mongols in 1220 and rebuilt in its current location, and remains today the provincial capital. From this rich history however, almost nothing stands out in modern Gorgan, and apart from a very small centre of traditional Caspian-style buildings, with overhanging terracotta-tiled, pitched roofs, the city is a rather ugly sprawl of unplanned modern development. 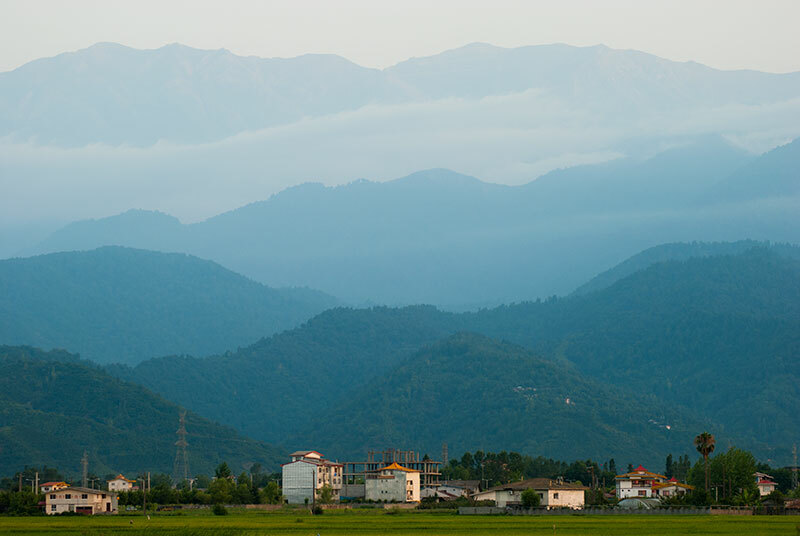 I leave Gorgan after one night, turning south the city’s eastern edge, driving initially through irrigated farmland and bright green rice paddies, then climbing steeply into the densely forested mountains on relentless switchbacks, passing through cloud and across a 2270 metre pass. Beyond the pass the cloud soon clears, revealing a rocky upland dotted with juniper trees, from where the road descends slightly to the small town of Chahar Bagh. Here the landscape has changed again and I find myself in the familiar high mountain valleys of Asia, in surroundings that bring to mind Pakistan’s Hunza Valley, or the Bamyan Valley in central Afghanistan. Small villages of mud and stone houses are surrounded by patchwork fields of wheat and barley, sometimes stone-walled and terraced above rocky streams lined by tall brush-like poplars. The people are extremely friendly, the sky is a clear, deep blue and the air crisp and fresh making for a slow and very enjoyable drive on empty dirt tracks, heading west along a valley high in the Alborz. I camp amongst some poplar trees and enjoy a cool night, with temperatures dropping down to 8º C, most welcome after weeks of sweltering heat since leaving Ukraine. In the morning I stop to admire the thousand year old Radkan Tower, a brick tomb-tower with a well-preserved Kufic script running below a sharp conical roof; architecturally impressive in itself, but all the more so given its beautifully remote location. Beyond the tower, the road climbs over steep ridges of dry oak forest, passing occasional ramshackle villages, then descending to the rice-growing town of Sefid Chah which has an unusually large and old graveyard with hundreds of carved gravestones. The road then climbs to the south once again, crossing a 2400 metre pass towards Dibaj and entering the high, dry plains of Semnan Province, which typify much of the country; the contrast between these dusty plains and the lush, humid forests of the northern slopes of the mountains, less than twenty kilometres away, is quite staggering. High in these barren southern slopes of the Alborz a little further to the west, I drive up a rough track to reach the striking travertine formations of Badab-e Surt, which have built up naturally into stacked white terraces of turquoise and red-tinged water below a hot mineral spring, and are particularly beautiful in the late afternoon light. Returning to the main road, I turn north and cross another pass, beyond which the air becomes humid once again and hazy in the early evening. I drop down further on the following morning, through steamy small towns set amidst fluorescent green rice paddies, winding over successive ridges thick with unspoiled forest, dropping eventually onto the Firouzkuh Road which leads over the southern edge of the Alborz, rolling down into the endless sprawl of western Tehran. Tehran’s traffic is infamous, but the city’s infrastructure is impressive, particularly the system of expressways, often consisting of elevated or fenced-in highways which allow one to drive at full speed through the heart of the city; for me, a peculiar attraction in a city which is otherwise almost singularly charmless. Coming in from the Firouzkuh Road, I’m swept onto the expressways; Babayi which becomes Sadr, turning onto Niayesh and plunging into a new tunnel which bifurcates underground, emerging in the district of Sa’adat Abad in the affluent north of the city where I will stay with another old friend of mine, Pouria. I first met Pouria when he was a student in Mashhad in 2007, where I stayed with him for ten days. Then a thoughtful, slightly unsure young man, Pouria now lives with his wife Sepideh in a new apartment overlooking the north of the city, works for a large multinational company and as a photographer, and it’s wonderful to see his confidence and success in life. 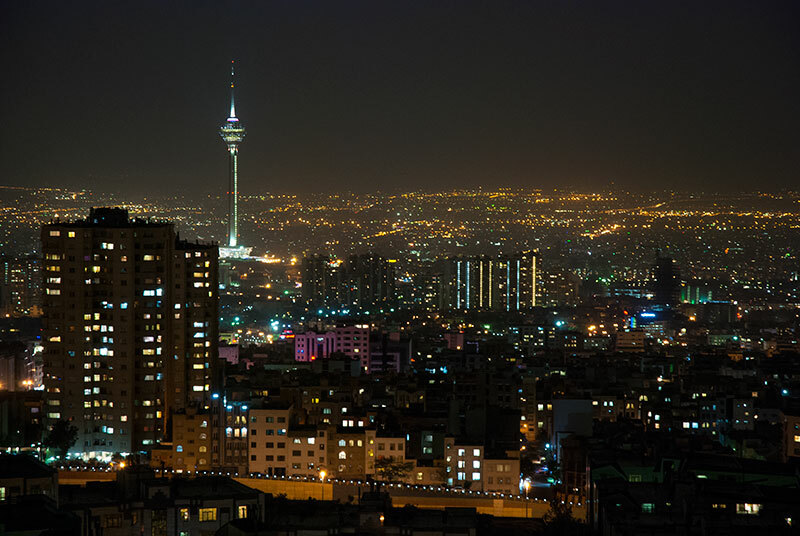 We spend evenings catching up and discussing future plans, or driving around the humming night-time streets of North Tehran, eating ice cream and visiting parks. 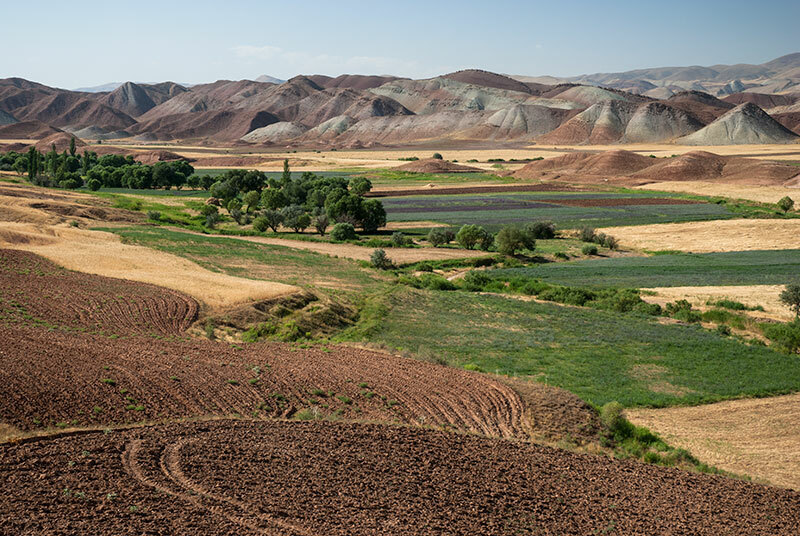 Whilst in Tehran I make a side trip west to the Alamut Valley, driving out of Tehran in the early hours of the morning, winding up into the mountains north of Qazvin to enter the valley at dawn, and stopping in the village of Gazorkhan. Here, on a near-vertical rock outcrop, a huge natural tower, are the scant remains of Hassan Sabbah Castle. It was here that the Persian polymath Hassan Sabbah, an adherent to a breakaway Islamic sect known as the Nizari Ismailis, after capturing the castle by subterfuge in the late eleventh century, made it the headquarters of a state of unconnected fortresses spread across Iran and Syria, known as the Nizari Ismaili State. The basis for Hassan Sabbah’s campaign appears to have been rebellion against the Seljuks, who controlled much of the region at the time, but his small, highly trained army who carried out propaganda, psychological warfare and assassination of both contemporary Islamic rulers and invading Christian Crusaders have endowed his state with a romanticised and semi-mythical history both in the Middle East and the in the West. It’s a steep climb up to the castle, which is surrounded by dramatic, misty mountain scenery, but little remains of the legendary fortress, and nothing of the libraries or luxuriant gardens for which the castle was famed, all destroyed by the Mongols in the mid thirteenth century when, with considerable difficulty, they finally subdued the Nizari Ismaili State, the last outpost of resistance in Persia. I drive further west along the valley where red-rock mountains and mud-brick villages contrast against bright green rice paddies, to Lambsar Castle, the other major stronghold of Alamut. Like that at Gazorkhan, Lambsar Castle towers over its surrounding from a very strong natural position, but very little remains apart from some stretches of perimeter wall which are slowly crumbling away, and by mid afternoon I’m back on the road to Tehran. After four nights staying with Pouria in Tehran I head back into the mountains. My aim is to relieve a frustrated ambition dating back to my very first visit to Iran, as a backpacker in 2003: to get an unobstructed view of Mount Damavand, which at 5610 metres is, by a considerable margin the highest peak in the country. I leave Tehran on the Haraz Road, turning off in the small town of Polour and winding up first towards the Lar Dam, then right at a camp of bee-keepers onto a dirt track which climbs past sparse clumps of beautiful wild vermilion poppies which sway in the summer breeze, up onto the Lar Plains. The road bumps and winds up through 3000 metres elevation, then splits again. I continue climbing, now past the summer camps of shepherds who dot the mountain-sides with stone corrals and khaki tents, and whose herds fill the air with the unmistakable scent of sheep. The track eventually reaches an altitude of 3700 metres from where there is a magnificent and totally unobstructed view of the symmetrical cone of Damavand, snowcapped and fluted with hardened ancient lava floes which retain streaks of winter snow cover. It’s a spectacular sight; one I have been wanting to see for eleven years. I camp for the night at a spot which local shepherds tell me is named Vararu; at 3000 metres, an idyllic grassy meadow surrounded by mountains which reminds me of certain spots in Central Asia. Descending back through Rineh, where I caught just a distant glimpse of Damavand in 2003, I rejoin the Haraz Road, turning east onto a far quieter road running through the Nur Valley, which eventually descends onto the infamous Chalus Road; one of the busiest, and therefore most dangerous roads in the country. Until midnight all the traffic flows southward on the road, and it is not until around 02:00 that I dare to face the endless rush of oncoming traffic, cautiously descending and turning off at the first junction, driving up again into the hills, where I stay with an extremely friendly Kurdish family in the beautifully situated town of Kelardasht. My host here is Fahime; a very engaging, confident and ambitious young woman, who lives with her mother, father and brother in a large wooden-roofed house. Her father, an active eighty year-old with hands like the paws of a bear, still hunts for wild pigs (for food) in the nearby hills and has surrounded the house with beautiful potted plants which he sells in the local bazaar. I’d love to stay longer with the family but I have a tight schedule and so in the late afternoon I’m following Fahime and her cousin down a beautiful winding forest road to Abbas Abad on the steamy Caspian shore, where we say farewell. The Caspian coastline of Iran is quite dramatic in places with tiers of misty, forested mountains plunging down into bright green rice paddies in a scene quite reminiscent of lowland Kashmir. However, choking traffic on the narrow coastal road, combined with totally unregulated building make for an ugly, polluted sprawl along much of its length, with only glimpses of what would otherwise be a breathtaking mountainous coastline. It’s dark when I reach my next destination, the small Gilani city of Lahijan, famous for its tea production. 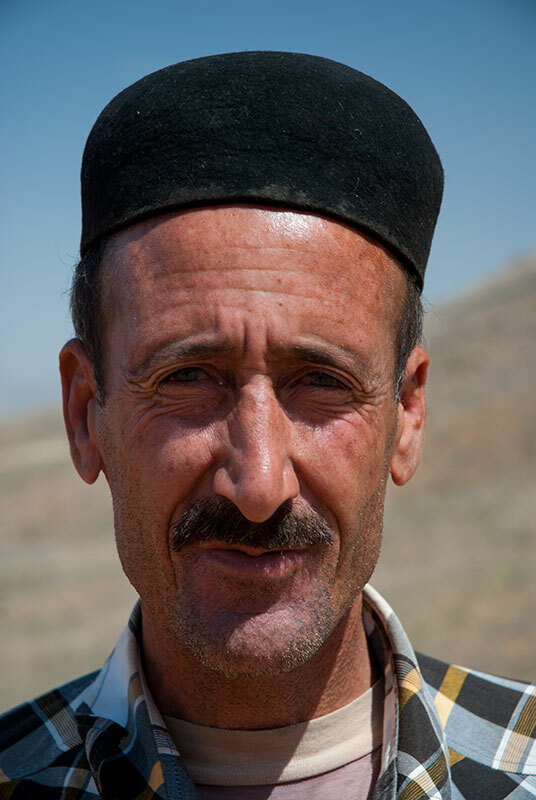 Here I meet my host Hojjat, a fast-talking Gilani student in his early twenties. Despite having only just met, we get on like old friends and I’m soon sitting with an intellectual group of his friends, smoking and drinking glasses of local tea in a small chaikhana (tea-house). Just a few metres up the road from the chaikhana, illuminated in the thick night air, is the highly distinctive shrine of Sheikh Zahed Gilani, a thirteenth century Sufi grandmaster (of Kurdish origin), teacher of Sheikh Safi-ad Din Ardabili, ancestor of Iran’s Safavid Empire which lasted from the sixteenth until the eighteenth century. Though far removed from it, there’s something in the close night air, the flitting pilgrims and the good company that put me in mind of the Sufi shrine culture of southern Pakistan which is so dear to me. In the morning I leave Lahijan, heading west into a wide coastal plain filled with rice and tea plantations. 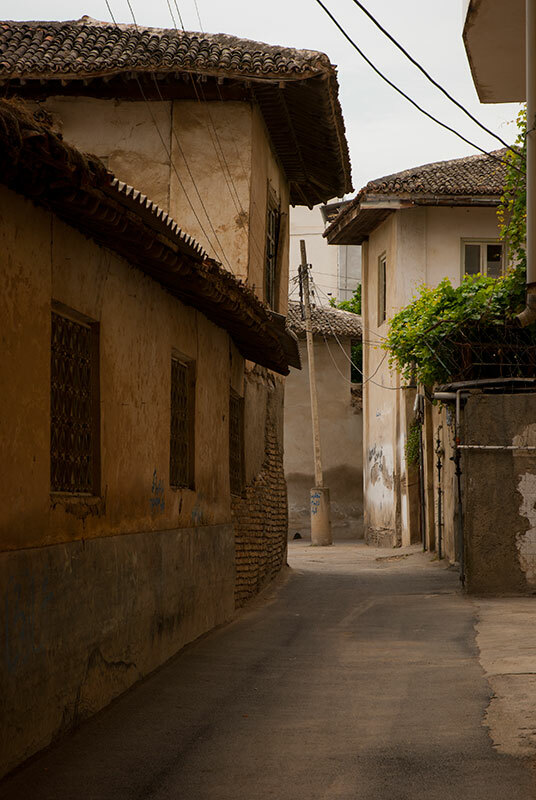 I stop in the town of Fuman, another spot I had visited on my first trip to Iran, purchase some of the sweet walnut-paste cookies for which the town is famed, then head north towards the Azerbaijan border. Here the coastal plain narrows once more, overlooked by the emerald-green Talysh Mountains, a north-western sub-range of the Alborz. In the town of Asalem I turn off the coastal highway and start to climb through beautiful, thick forest, passing damp villages in a narrow valley. Rain soon starts to fall and as I climb I quickly enter the clouds, driving through fog so thick that I cannot see anything beyond the front of the truck; even sticking to the asphalt road is difficult at times. A pass tops-out at around 2400 metres, but the cloud obscures all views and I decide to camp for the night in a deserted side road on the edge of the mountain. The fog soon disappears on the western side of the mountains as I drop into the small town of Khalkhal the following day, and the landscape becomes quite dull. I stop in the afternoon in Ardabil, one of very few large Iranian cities which I have not previously visited. I visit the beautiful shrine complex of Sheikh Safi-ad Din Ardabili, disciple of Lahijan’s Sheikh Zahed Gilani. Safi-ad Din was a thirteenth century Sufi who founded the Safaviyya Sufi Order here in Ardabil. His descendants would go on to found the Safavid Empire in 1501, a pivotal point in Iranian history in that it was the first native dynasty since the Arab overthrow of the Sassanids in the seventh century to create a unified Iranian state. The Safavids built an empire which stretched beyond Persia into much of Central Asia to the edges of Europe and the Indian Subcontinent, spread Shi’a Islam across the Persian heartland and left a fantastic legacy of architecture and arts; all things which are very much the cultural backbone of contemporary Iran. The ensemble of buildings includes the Sheikh’s shrine and a khanaqah (meeting place of a Sufi brotherhood) with numerous attendant buildings, today a museum. 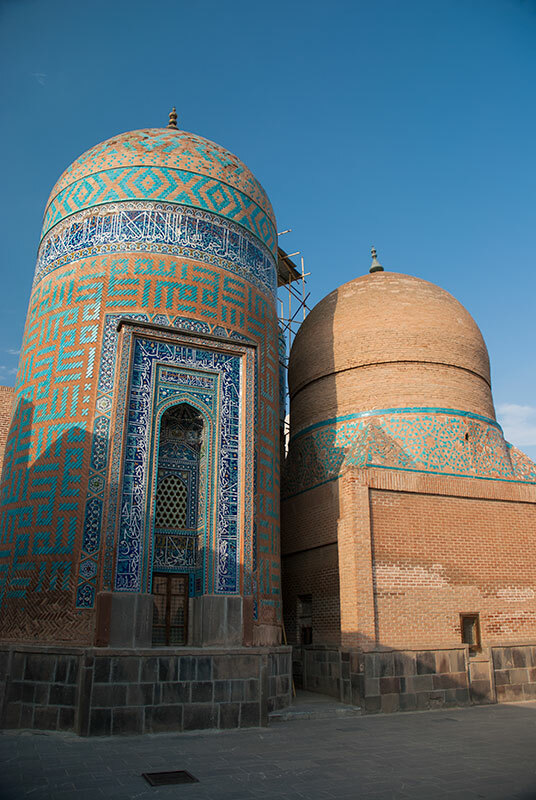 The architecture is magnificent, if restrained in scale, and shows strong influences from earlier Timurid architecture of Central Asia, most recognisably in the beautiful, stubby, turquoise-tiled tower which houses the sheikh’s grave and could have been taken straight from Samarkand. There is little else of interest in Ardabil, aside from the novelty of having to wear a coat on a July evening, and so the following morning I return to the mountains, now clear of clouds, and pick a descent towards the coast on a steep and twisting unpaved road. After a short, steep climb on a rocky track from the village of Andabil, a wide, grassy amphitheatre of rolling hills opens up, backed in the north by a steep mountainside, itself a mottled patchwork of bare brown earth and lush grass. Below me a muddy track descends into green grassy meadows, peppered with shepherd’s summer huts. 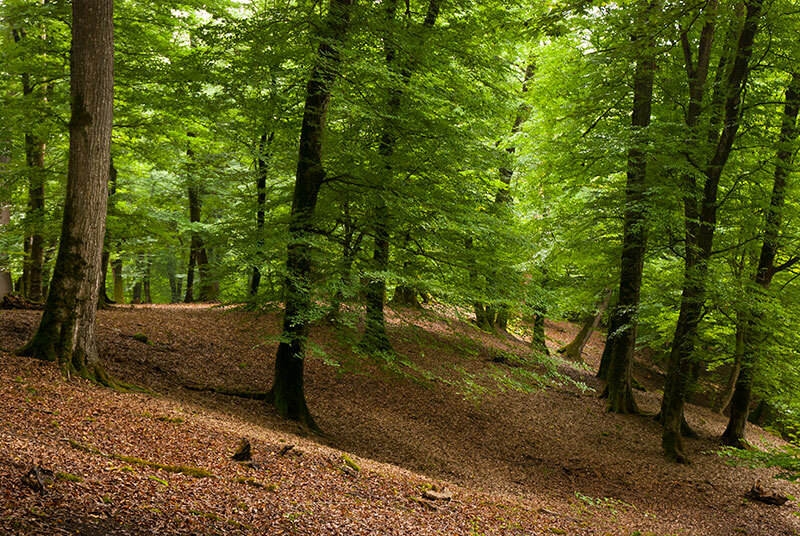 Beyond the meadows I drop into a twisting river valley and the hillsides become forested with oak, ash, alder and lower down, old, scraggly, moss-covered elms growing next to the braiding river. I pass through the village of Nav which is one of the least modernised settlements I can remember seeing in Iran: picturesque whitewashed houses with wooden or corrugated iron roofs and wooden shutters over the windows. The track is rough in places, but the glorious, peaceful forest and is a joy to drive through until, after several hours I emerge onto the paved road back down to Asalem. Having traversed much of the Alborz, I now take myself down into the Zagros Mountains, driving from Asalem through the night via Qazvin and Isfahan almost eleven hundred kilometres south into the sweltering heart of Iran, arriving in the afternoon in the city of Yasuj, nestled at around nineteen hundred metres in the central Zagros, capital of Kohgiluyeh and Boyer-Ahmad Province. I am hosted here by Mehran, who is a Lur, an ancient Iranian people who make up much of the population of this region, and whose language is close to archaic Old Persian. Mehran takes me out of Yasuj in his car, driving through mountains with beautiful oak forests growing on dark earthy hillsides which look as if they have been raked, up into the slopes of the Dena Range which reaches an altitude of 4409 metres, making it the highest section of the Zagros. We leave the car and walk up rocky hillsides, eventually coming upon a beautiful alpine meadow where Luri nomads have made their summer camp in traditional black tents, and who give us tea with bread and butter to eat. Mehran studies in Yasuj, but as the weekend is arriving, he invites me to meet his family in his home town of Dogonbadan, one of Iran’s original oil boom towns. We drive together in his car, dropping quickly down from the mountains through the Dasht-e Rum, the Rome Plains, where Mehran tells me that Alexander the Great forced his way (with the help of local treachery) through the ‘Gates of Persia’, and into the Persian heartland and the capital at Persepolis. It’s a real pleasure to be hosted by an Iranian family, being fed lavishly with delicious home-cooked food, but lying on the edge of the lowlands just seventy kilometres from the Persian Gulf, Dogonbadan’s mid-summer heat is ferocious, with days above forty-five degrees and enough humidity to deter any of us from leaving the air-conditioned house. 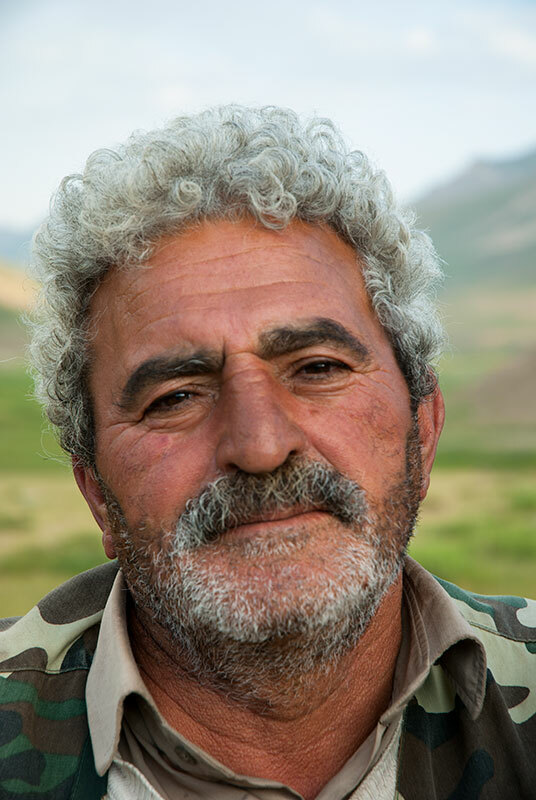 I leave Mehran and his family the next day, taking a shared taxi back to the relative cool of Yasuj, then driving through Sisakht and up into the Dena Range on Iran’s highest road, crossing a 3150 metre pass. The views are far less dramatic than the green ridges of the Alborz, but these dry, craggy slopes teem with nomads who here, on the north-eastern side of the pass, are not Luri but Qashqai; a Turkic nation originating more recently in Central Asia who are renowned for their ‘Shirazi’ carpets. 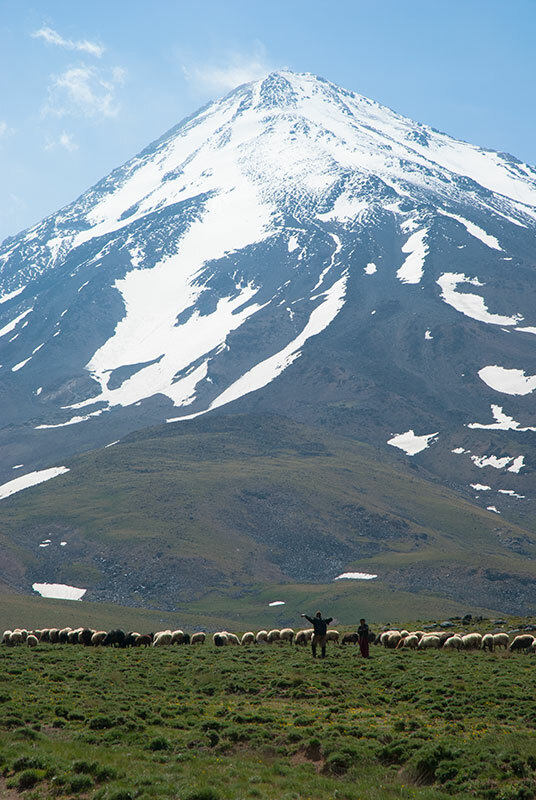 I stop on these north-eastern slopes of Dena to admire the view, and meet a Qashqai man who points out his family’s siah chador (black tent); the archetypal boxy nomad’s dwelling moored to the rocky ground by guy ropes. The hills are dotted with such tents and flocks of grazing sheep, and I imagine that, save for the motorcycles and pickups, I am seeing the area much as it looked when the ancestral Iranians were freshly arrived here from Central Asia. It’s very enjoyable driving slowly down through small mountain villages in the afternoon, and I stop to camp in a field of golden wheat, still overlooked by the jagged peaks of Dena. In the morning I start a long drive back north, staying as closely as possible in the mountains, passing through Shahr-e Kord and then Chelgerd where the banks of the Kurang River are full of the tent-camps of Bakhtiaris, a sub-group of the Lurs whose men wear distinctive baggy trousers similar to those traditionally worn by Kurds. Leaving the river, I start climbing again through mud-brick mountain villages, over a 2700 metres pass to Fereydun Shahr, then join the main highway to the city of Khorramabad, capital of Lorestan Province. Khorramabad is an attractive city, surrounded by dry hills but with ample greenery thanks to water which is channelled in from nearby springs. Centred around the Falak-ol Aflak Castle, the city radiates out in fairly neat blocks along a small river, and the disorganised urban sprawl which marrs many of Iran’s cities seems thankfully to have been averted in Khorramabad. I spend a full day with my host Ashkan, and also meet with my old friend Reza who drives up from 50º C Shush with his father just to visit me. A student when I first met him in 2007, Reza is now a successful musician (and has become quite chubby), while his wiry and energetic father has not changed visibly at all. From Khorramabad I head away from the mountains to Arak, the capital of Markazi Province. Though a modern, heavily industrialised city, Arak surprises me by having a beautiful two hundred year old Qajar-era bazaar, a showcase of classical Persian urban architecture with lofty vaulted passageways, a beautifully domed central hall and an old, central caravanserai; a central, watered plaza with an old mulberry tree, surrounded by two tiers of small shops and artisan’s workshops where men are busy repairing dusty old carpets by hand. 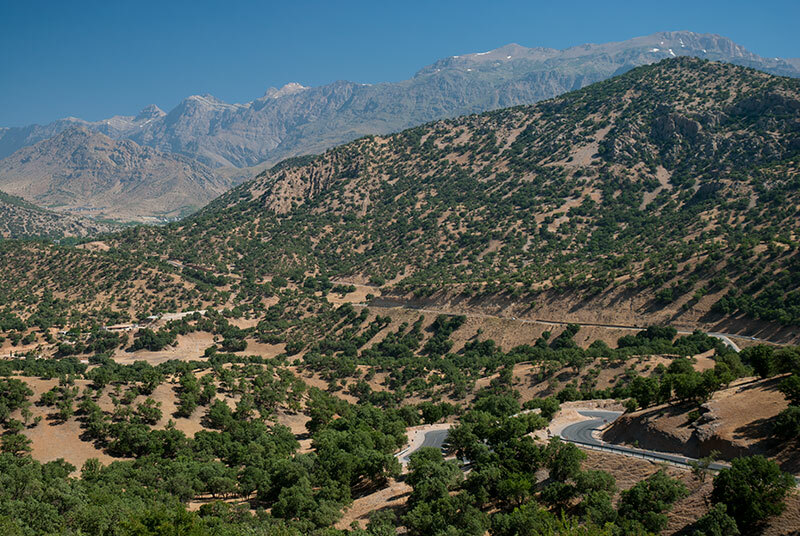 The quality of the Iranian road network is such that even small country roads are of excellent quality, and I make use of this fact heading north from Arak through watered valleys where swaying poplars, fields of melons and orchards of apples, peaches and cherries are set against barren brown and reddish mountains. I stop in the village of Delijan in Hamadan Province to admire the Ilkhanid-era Imamzadeh Hod, out amid the fields, with traces of antique faïence in its blind arches. To find ancient shrines like this sitting peacefully in the middle of nowhere is another of Iran’s great pleasures. Continuing on backroads, I enter Qazvin Province to stop at the more impressive Karraqan Towers; damaged by a nearby earthquake in 2002, with one of the two squat, octagonal towers supported by crude wooden buttresses, but whose elaborate, thousand year-old geometric brickwork is notable for having survived the ravages of the Mongols, as well as of time. I then move west into Zanjan Province, driving through striking banded red-rock hills, back into the Zagros, camping for the night near the town of Bijar in Kurdistan Province, then north again into West Azerbaijan Province and the UNESCO World Heritage Site of Takht-e Soleyman (Solomon’s Throne). Takht-e Soleyman is notable as the site of one of the holiest fire temples of the Zoroastrian religion during the Sassanian era (third to seventh centuries). Destroyed at the end of the Sassanian era, it was presumably the Arabs who bestowed upon the ruins their current Semitic name. The site was partially rebuilt in the thirteenth century, though never regained its importance and today remains heavily ruined. Perhaps more interesting however than the ruins themselves is the intriguing location of the site on a high plain: built on the oval-shaped rim of an ancient volcanic crater, around a brim-full crater lake of deep blue, mineral rich, but lifeless water. Behind the ruins off to the west is another volcanic remnant; a far steeper crater known as Zendan-e Soleyman (Solomon’s Prison) where legends tell that King Solomon imprisoned monsters. It’s nice to return to the site, which was one of the places I had visited on my first trip across Asia in 2003, but the real historical significance of Takht-e Soleyman is somehow lost to me amid the jumble of rather indistinct ruins. I set off on a long, winding drive through Iranian Azerbaijan in the afternoon, passing villages of squat mud houses, sometimes with ricks of drying grass and hay atop their flat roofs, similar to those seen in some of the remotest parts of Afghanistan. 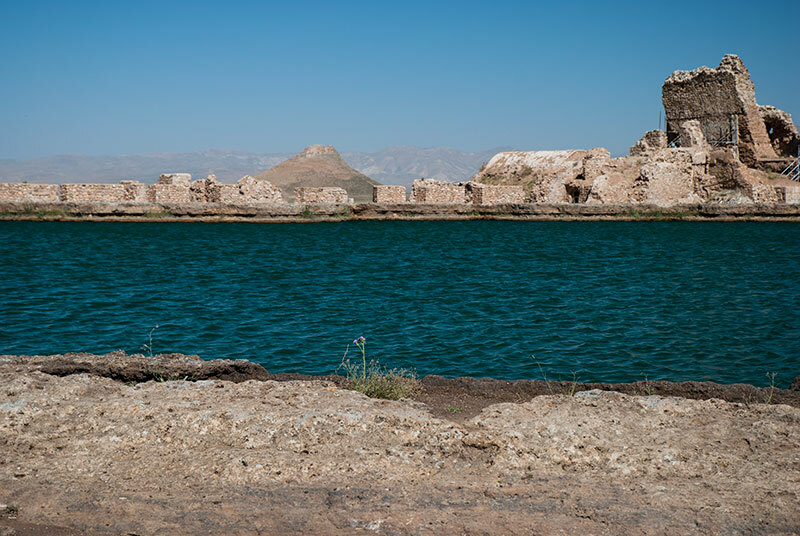 By late afternoon I’m getting close to what used to be the eastern shore of Lake Urmia, and make a stop in the friendly county town of Maragheh. 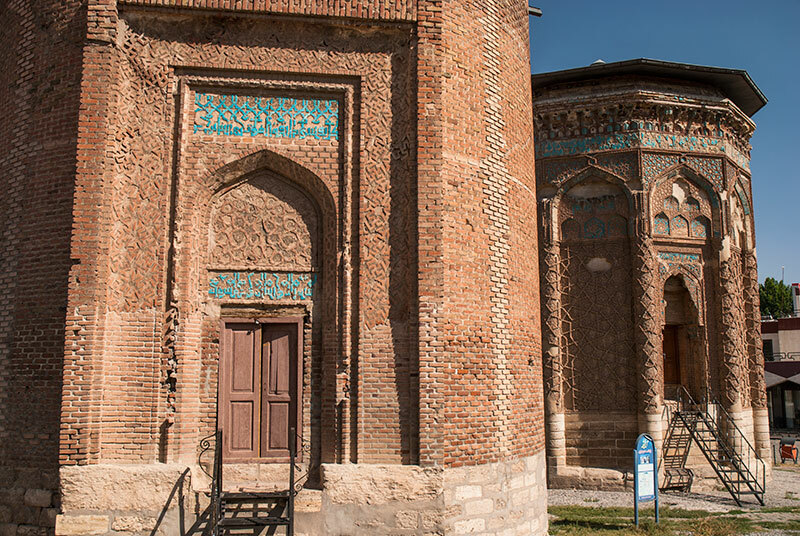 Though now a small and unimportant place, Maragheh was made capital of the Ilkhanid Empire in the mid thirteenth century by Hulagu Khan, grandson of Chinggis Khan. I spend a couple of hours in town seeking out the Mongols’ architectural legacy in the form of four funerary monuments; the Ghaffariyeh Dome, a squat, cubic mausoleum with a simple corbelled entrance portal covered in turquoise tiles; the twelfth century Gonbad-e Kabud (Blue Dome), an exquisite hexagonal tomb tower covered in mesmerising geometric brick reliefs which is the finest of the four; the adjacent and slightly older Borj-e Modavar (Round Tower), indeed round in section and plainer, but still with a fine entrance portal; and finally the Gonbad-e Sorkh (Red Dome), rather less graceful and adorned only with brick relief work, but located on the southern edge of town in its own small park which must also be of considerable age. Not far from Maragheh, on the northern side of Mount Sahand lies Tabriz, where I stop for three days. 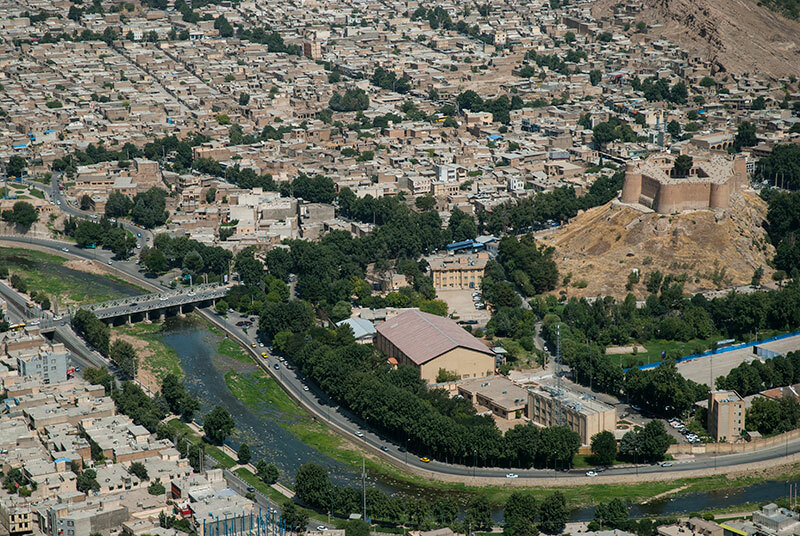 Backed by red mountains to the north, Tabriz is the most important city in north-western Iran, and was on numerous occasions in the past the capital of the country. A city with a majority population of Iranian Azerbaijanis (who are simply called ‘Turks’ in Iran), Tabriz feels very slightly European, lacking the exotic urban architecture of Isfahan or Shiraz, but is instead notable as a centre of commerce, one of the principal cities on the Silk Road, visited by Marco Polo in 1275. 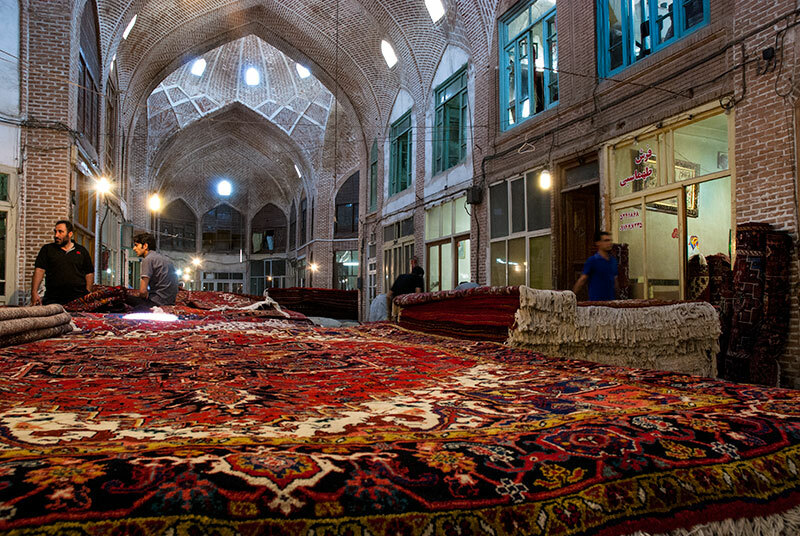 The highlight of Tabriz is undoubtedly its bazaar, said to be the world’s longest, and which is in my opinion the finest in Asia. 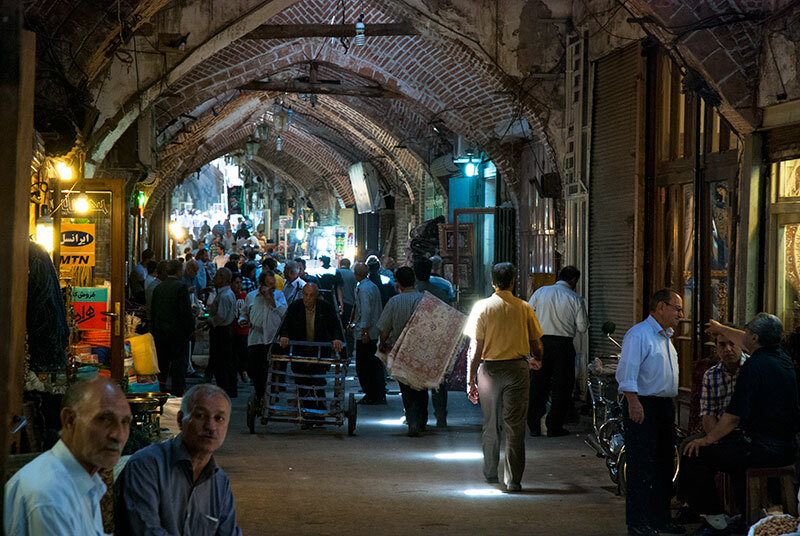 Tabriz’s bazaar is a place of sensual delights; with its beautiful, long vaulted passageways, spot-lit and ventilated by holes in the ceiling, thronging with shoppers and merchants. The air is thick with the hubbub of commercial transactions, lengthy, animated conversations between shopkeepers and the shouts of trolley-pushing porters who part the crowds to deliver goods into the small, cave-like shops. The nose is greeted by various smells; spices and dried fruits, delicate Middle Eastern perfumes and the bitter scent of dyed wool. The eye is caught by the endless procession of oncoming faces as one walks through the crowds; by paintings, by sacks of colourful foodstuffs, confectionery, lingerie, brass ware, but most of all by the sumptuous deep reds and blacks of the carpets, the sellers of which sit in their own large section of the bazaar atop huge, expensive rugs, patiently waiting for customers, talking amongst one another over endless cups of sweet red-brown tea brought to them on silver trays by errand boys from a nearby chaikhana. The bazaar is so much more than a shopping centre, and its interconnected passageways and open spaces have historically been important not just for commerce, but as centres of social, educational and religious practices. It seems to me the architectural embodiment of the very essence of contemporary Iranian culture; drawing heavily on a great historical legacy of empires and trade, deeply human, steadfastly clinging to its own identity, oblivious to the characterless face of globalised modernity. Tabriz feels like a good place to conclude my trip through the Alborz and Zagros Mountains, poised as it is at the edge of both ranges. From here I will continue in a north-westerly direction, towards and then across the Aras River into the Azerbaijani exclave of Nakhchivan, and on into eastern Anatolia, all lands once part of ancient Armenia. I have been fascinated with your blog for a while, I’ve read through the entire thing. Want to let you know that you are doing a real service cataloging your journeys for other people. I do have a question though, I’m assuming you are traveling through Iran with a UK passport. How are you able to travel independently? I am American myself and would love to go to Iran but the current red tape for US and UK citizens says that we need to be accompanied by a guide. Is there some agency loophole that I haven’t found? Thank you very much for your comment, I am always pleased to hear from people who read my articles and admire your tenacity for reading through them all! I’m afraid that there is no legal loophole as far as I know. Up until 2010 I travelled in Iran with my British passport; I had occasional hassles from the authorities, but in those days it was still possible for a UK passport holder to travel independently. As of 2014 British nationals were subject to the same rules as US nationals, however I have a second European passport which I have used for visiting Iran more recently. So I’m sorry to say that short of getting another passport, I can’t think of any legal way to avoid having to take a guide. On the flip side, I have often heard / seen accounts from travellers who went with a guide to Iran and thoroughly enjoyed it. I think it could be a good way to make a first time visit, if you can put up with the regimented itinerary. I hope you get to experience Iran soon, guided or otherwise.